The rustic nursery decor ideas (especially the homemade wooden baby crib) featured in pictures of this baby boy's room would be right at home in a hunting lodge or a log cabin when, in fact, that is not the case at all! You all may be surprised to learn that this room, with its exposed log ceiling beams and the homemade Mission style crib constructed of reclaimed wood, is not sitting smack dab in the middle of a forest or in a wilderness setting at all! This room is a beautiful example of how to decorate and create a peaceful oasis where parents can escape from the busy day-to-day world to enjoy their child. The exposed log beams form a grid pattern on the baby's nursery ceiling giving the space an older look with character that usually comes with the passing of time. Careful planning by the decorator paired with the parents unique baby crib plans fast-forwarded the aging process in a big way. 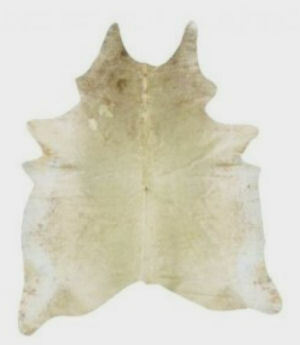 One of the features that stands out in the room is the cowhide area rug that adds a distinctive western touch to the space. Remove the bird decorations, add a few horseshoes and VOILA, a cowboy nursery! Hang a trophy buck on the wall surrounded by rifles and a hunting lodge nursery theme emerges. The wooden birds of the crib mobile that flutter directly in baby's line of sight seem to have escaped from the open doors of the wooden birdcages. A trio of bamboo birdcages suspended in a corner of the room lighten the substantial presence of the distressed wood ceiling beams and nursery furniture. 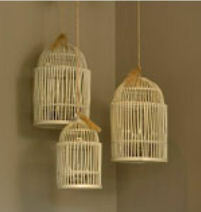 The birds perched on the top are similar in color to the wood of the cages. If more color was desired; this would have been the perfect opportunity to explore possibilities. Another means of expanding the color scheme in a rustic nursery would be the addition of a colorful, vintage quilt. The parents of this baby were obviously going for a more sophisticated (ala Restoration Hardware?) look with varying shades of brown preventing the earthy color palette from becoming too dark or heavy. 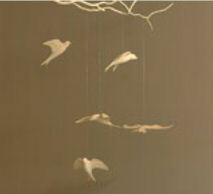 The bird wall decals positioned to the side of the baby mobile give the display a three dimensional feel. A glass front bookcase in antique walnut that was relocated from another room of the home holds decorative storage baskets used to organize baby's toiletries, changing supplies and toys. I hope that you have enjoyed your visit to Unique Baby Gear Ideas and have been inspired by this unique, rustic nursery design created by Zeal Interiors. When your baby's room has been decorated please visit us again to share your own nursery pictures. Can you please email me the plans for the crib in the picture? I would love to find someone to build me a crib like the one in this photo. Like all the other posters, I would appreciate someone providing a link to a woodworking plan or an online tutorial showing how to go about making this crib. I love the crib, if you can please email me and tell me where to buy one! 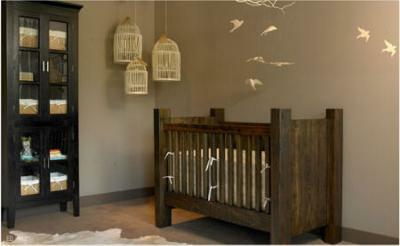 We are expecting and I would love this crib for my first childs room. Any info on the crib? Plans or manufacturer. Want it! I love this crib! I am pregnant with my first and my Dad wants to build me a crib. This is the one that I just fell in love with. Please let me know where I can get the plans for him so he can get started! Did anyone figure out who made the crib? by: Wholesale Log Homes Inc. I've learned that there are many different nursery themes out there suitable to rustic designs. My thought are that it's important that you pick one based on a color, activity or style that you love that you will enjoy living with for the next few years and if you plan carefully, even longer possibly past the toddler stage! Very nice! We are finally expecting a baby boy after two beautiful girls and I'm due this month. We had lots of stuff for the nursery but it was all obviously for a girl. The husband wanted this room to be ALL BOY and wanted to do a wilderness, hunting outdoor-sy nursery theme and I wanted an airplane or aviation theme. Since we couldn't agree; we've done nothing and are running way behind schedule. I understood that after the girls that he wants a nursery that is more sophisticated but couldn't wrap my head around a room filled with hunting trophies and weaponry and our funds are limited. This photo finally put us on the right track! I ADORE that crib and am looking for plans right now to get something similar built FAST! I love this website and am so happy that I found it just in time. Join in and write your own page! It's easy to do. How? Simply click here to return to RUSTIC NURSERY IDEAS.